Wadjet Eye Games released a game that was a commercial remake and expansion of Dave Gilbert's short, incomplete freeware game, Bestowers of Eternity. That game, Blackwell Legacy, is the first chapter in a five part series. It starts things off with a bang, delivering a great adventure game with interesting puzzles and a fantastic story. The game follows a young woman named Rosangela Blackwell, who has just lost her aunt, and learns of her legacy as a medium who can see and talk to ghosts. Rosa learns that she contains a portal to the afterlife within her, and her spirit guide, Joey, is the link that allows spirits to enter that portal to move on to the afterlife. Joey and Rosa must finish unfinished business for spirits before they can accept their fates and move on. The story is well done, and is entertaining from start to finish. There is just the right amount of comedy and drama, and Dave Gilbert manages to write both exceptionally well. The majority of the game is played as Rosa, since Joey can't affect the mortal world, outside of a small, ghostly breeze. However, Joey is the main person to speak to spirits, as they relate to him better. The majority of the game is played through standard inventory puzzles and puzzles from dialog trees. However, the ability to combine information learned from notes has returned from The Shivah. Here, Rosa has a notebook, and she has written down vital information inside. Sometimes new leads can only be found by combining one item in the notebook with another, which will cause Rosa to realize the links between the two. This mechanic was one of my favorite parts of The Shivah, and it's handled even better here. 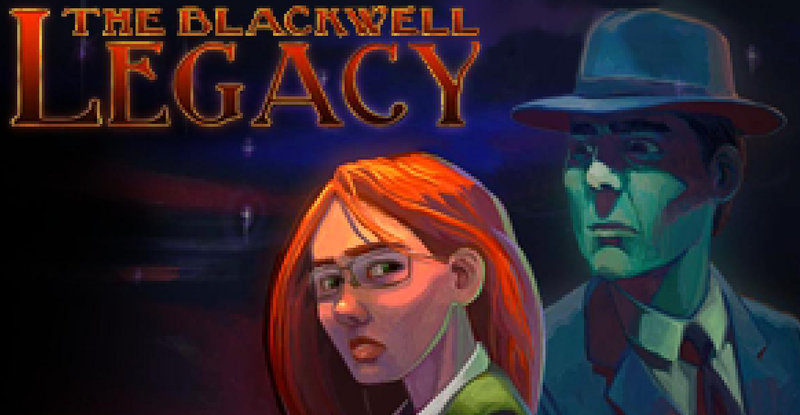 Blackwell Legacy is presented in the same fashion as most Wadjet Eye games. The graphics are low resolution, so characters and backgrounds are pixelated. The backgrounds manage to be quite well done despite the pixelation, recreating the city of New York quite well. So, when Rosa and Joey talk on a pier with the Brooklyn Bridge behind them, the graphics don't take you out of the experience, but, in contrast, help to set the mood of the scene. The characters have portraits which are animated when the characters speak, which go a long way to convey emotion in a way that the low resolution character sprites can not. The game was updated in 2011, so the version currently available also has improved fonts, compared to the original version, released in 2006. The music of the game is well done, and fits the tone of the game well. Sometimes the levels of the voice work can vary, and some recordings can have an overly loud sibilance, but overall the voices are quite well done. The updated version of the game has re-recorded voice over work by Rebecca Whittaker, who played Rosa in the later games of the series, replacing Sande Chen from the 2006 original. This was done both for consistency for the later games in the series, and so some of Rosa's dialog could be changed for the new version. Rebecca does a great job with the role, and her dialog fits well with the rest of the game. If you didn't know that it wasn't there originally, you wouldn't even know that they were new recordings for the updated version. The game also contains bonuses, some of which unlock at the end of the game, such as the bloopers, and others, such as the commentary tracks, which are selectable from the start via the menu. The 2011 version has two commentary tracks, the original 2006 commentary, and new commentary for the fifth anniversary of the game. It's possible to play either of these tracks, or both at the same time. Both will be displayed automatically at certain points in the game, and will stop gameplay while they're being told. It's possible to skip any of these tracks at any time by pressing a key on the keyboard. It's nice that these bonuses have been provided, as they are completely optional, and they provide a fun insight into the development of the game. The Blackwell Legacy started the series off brilliantly. The origin story of Rosa and Joey was told in a strong fashion, and already went a long way to provide character moments to endear gamers to these characters. The writing is excellent, and the music is great as well. The voice over work is mostly well done, with a few technical hiccups. The changes to the updated version of the game are mostly subtle, and manage to fit within the game well. Rebecca Whittaker's new recordings of Rosa, in particular, fit in the game so well that you wouldn't know they were new. The game is a tad short, but the first outing of The Blackwells is a grand one, and is a must play to anyone who likes classic adventure games.